Riley Road Brighton, was the birthplace of one of vaudeville’s most popular and unusual acts, conjoined (or Siamese) twins Daisy and Violet Hilton, yet few Brightonians have heard of them. The beautiful girls, joined at the hip, were born to Kate Skinner in 1908, but their mother was horrified, thinking that she was being punished by God for being unmarried. She sold the girls to the midwife, Mary Hilton, who had delivered them. Mrs Hilton saw the twins as a means of making money, so she began displaying them to paying customers at the Queen’s Arms pub in George Street that she ran with her husband. As they grew, she taught them to sing and dance and play musical instruments. 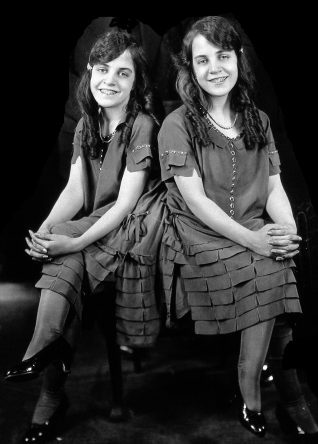 At the age of three, the twins were on the road touring Britain, Europe, Australia, and finally the USA, where they settled in 1915. They were extremely popular, being pretty and talented. They made huge amounts of money, but Mary Hilton kept the lot. When Mary died, the guardianship of Daisy and Violet passed to Mary’s daughter and son-in-law, Edith and Meyer Meyers. The Meyers controlled every aspect of the girls’ lives, and they were little more than slaves. The twins earned thousands of dollars a week, but, again saw none of it. In 1931, they managed to release themselves from their contract with the Meyers, and formed their own vaudeville show called ‘The Hilton Sisters’ Review”. They starred in the film ‘Freaks’ released in 1932. The following year they visited Brighton and topped the bill at the Hippodrome. They tried to find their mother, Kate Skinner, only to find that she had sadly died many years before. The twins fell in love at various times, but relationships were difficult for obvious reasons. One of them tried to get married, but was denied a marriage licence. The other twin did later get married, but it was discovered to be a publicity stunt and was annulled after a month. As time went on, tastes in entertainment changed, and the twins’ popularity began to fade. In 1951, they starred in ‘Chained For Life’, a rather tasteless film, loosely based on their lives. The film flopped and they struggled to make a living, at one time opening a hot dog stand in Miami. In 1961, abandoned at the side of the road in North Carolina by a tour manager who went off with their earnings, they were taken in by the local people and given a home and a job bagging groceries in a supermarket. In January 1969, after failing to turn up for work, they were discovered dead in their trailer home. Daisy had died of Hong Kong flu, and Violet had died a few days later. They were aged 60. A sad end for twin girls who had been born in Brighton, and used and abused for much of their lives. I can remember my grandparents on both sides talking about these twins as they had lived near by.